You'll be £11.99 closer to your next £10.00 credit when you purchase Newcastle at War 1939–45. What's this? Newcastle was a key cog in the national war effort despite its northerly location, located on the key East Coast it played a significant military and civil role in the war. Newcastle is situated on the strategically important River Tyne and was well defended against enemy attack with several forts and other measures in place. 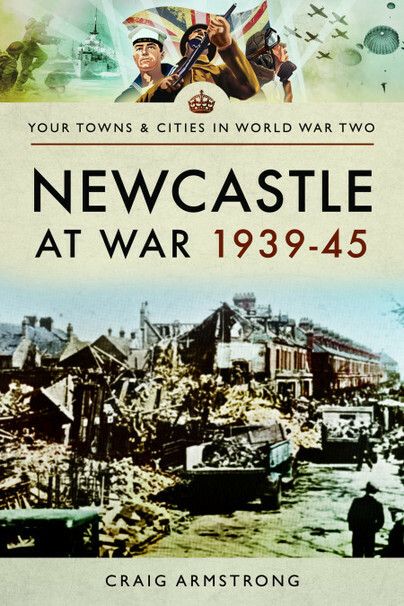 Newcastle, a largely urban industrial community, was home to key wartime industries with its shipbuilding yards building and repairing huge numbers of vessels, both naval and merchant, throughout the war and its munitions and heavy engineering also making key contributions (especially in the construction and fitting of heavy naval guns). This made the town a significant target for the Luftwaffe and several determined raids were made which inflicted heavy casualties, especially during 1941. The city also became the centre of a widespread ARP scandal when local and national enquiries revealed large scale corruption at the centre of the ARP organisation and council. The subsequent investigation resulted in several prosecutions, resignations and a national re-organisation of ARP services. The industries of the city were not without their problems and, despite great patriotism being evidenced, there were several notable illegal strikes including those of dockworkers, engineers and the infamous apprentices strike which saw several prosecutions and resulted in the imprisonment of several suspected communist instigators. The book also looks at the considerable contribution made by the men and women who volunteered for the ARP and Civil Defence Services. The heavy raids on the city resulted in great loss of life and the men and women of the emergency services were faced with horrifying scenes which they had to overcome and work through. No member of the community was left untouched by the war whether they were evacuees (the author’s father was one of them), workers, servicemen or just civilians struggling to maintain a home in wartime Britain. Born and bred in Northumberland, Dr Craig Armstrong is an experienced historian with a special interest in the history of the North East of England and the Anglo-Scottish Borders. He has expertise in nineteenth- and twentieth-century history with a particular focus on social and military history. Dr Armstrong currently splits his time between teaching at Newcastle University and working as a freelance researcher and writer on all things North Eastern.